New show by The Pink Room Burlesque at Bedlam on 40 Avenue C - Visit The Pink Room & check back here soon for more details! ONE ONE NINE, ONE NINE! TIX NOW ON SALE AT JOESPUB.COM! CAST TO BE ANNOUNCED SOON! The Miss Twin Peaks Pageant has been going strong for over 7 years but it’s time to let the boys have a little fun! This will be the second Mister Twin Peaks Pageant hosted by The Pink Room Burlesque. Last year’s Mister Twin Peaks Pageant was packed with David Lynch burlesque fans and we have no doubt this year will be the same! Some of this year’s cast include some good ol’ classics like Special Agent Dale Cooper, but much like David Lynch we like to keep some of our cast a mystery. The Pink Room Burlesque is a tribute to and satire of the works of David Lynch. Since the anniversary of Laura Palmer’s death in February of 2011, Francine and The Pink Room cast have covered everything from Twin Peaks, Fire Walk With Me, Blue Velvet, Wild At Heart, Lost Highway, Mulholland Drive, Eraserhead & Inland Empire. Francine & The Pink Room were recently featured in Showtime documentary “The Phenomenon” and on ABC’s Nightline along with David Lynch & Kyle MacLachlan. 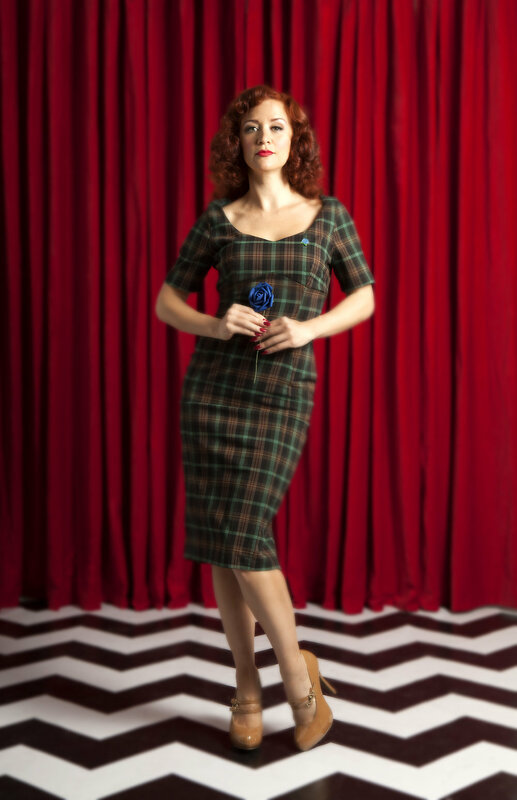 Francine & The Pink Room also starred in the official Showtime pop-up “A Tribute to Twin Peaks” at Brooklyn Bazaar. To say the least, The Pink Room Burlesque is now “Lynch-approved”. Francine “The Lucid Dream” is a singer, burlesque performer and producer of both The Pink Room & Dreamboat Burlesque. She is the reigning Queen of Como Lake, Italy & Miss Twin Peaks 2016. She has appeared on NBC’s Today, Showtime’s “Twin Peaks: The Phenomenon” , ABC’s Nightline as well as WNYC’s 44 Charlton at The Greene Space. Francine has had the honor of sharing the stage with Colin Quinn, Horatio Sanz, Murray Hill, Bridgett Everett and entertaining such notables as Lady Gaga, Donatella Versace, Kate Upton, Seth MacFarlane, Joaquin Phoenix & Jeremy Renner. ABOUT JOE'S PUB AT THE PUBLIC Named for Public Theater founder Joe Papp, Joe's Pub at The Public opened in 1998 and plays a vital role in The Public's mission of supporting young artists while providing established artists with an intimate space to perform and develop new work. Joe's Pub consistently presents the best in live music and performance nightly, continuing its commitment to diversity, production values, community and artistic freedom. The organization also offers unique opportunities like New York Voices, an artist commissioning program that provides musicians the resources and tools needed to develop new original works. Commissioned artists have included Allen Toussaint, Ethan Lipton, Toshi Reagon, Bridget Everett, and more. In 2011, the Pub received a top-to-bottom renovation, leading to improved sightlines, expanded seating capacity and a new menu from acclaimed Chef Andrew Carmellini. With its intimate atmosphere and superior acoustics, Joe's Pub presents talent from all over the world as part of The Public's programming downtown at its Astor Place home, hosting approximately 800 shows and serving over 100,000 audience members annually. The Pink Room Burlesque: No Hay Banda! “No hay banda. There is no band. It is an illusion.” The Pink Room Burlesque is known for paying tribute to David Lynch’s lush and haunting visuals. Francine “The Lucid Dream” and the cast of The Pink Room will honor the sounds that make the works of David Lynch so unique and beautiful. No hay banda, but there will be music in the air. This special night at Joe’s Pub will feature some of New York City’s favorite cabaret singers as well as premiere Lynchian burlesque artistes. Celebrate 7 years of David Lynch Burlesque in NYC with Francine "The Lucid Dream"
The Pink Room: David Lynch Burlesque’s 7th Annual Miss Twin Peaks Pageant at Joe’s Pub! About The Miss Twin Peaks Pageant: The Miss Twin Peaks title is the most coveted honor in this little town where a yellow light still means slow down, not speed up AND it is the most coveted honor in all of David Lynch Burlesque right here in New York City! It is all the things everyone has come to love of The Pink Room Burlesque: Schäffer the Darklord rapping his original song “A David Lynch Movie”, our audience participation challenge, Chug-a-lug Donna, and burlesque performances by many of the characters from Twin Peaks - both the original and The Return on Showtime! This is a special Saturday night show to celebrate the January birthdays of both David Lynch & TPR producer, Francine. You never know who may show up onstage or in the audience. Costumes always encouraged! Hosted by Schaffer the Darklord; Performances by: Bunny Buxom, Francine “The Lucid Dream”, Minx Arcana, The Pink Room Dreams, Seedy Edie & more! Hosted by Schaffer the Darklord; Performances by: Anna Copa Cabanna, Bunny Buxom, Foxy Vermouth, Francine “The Lucid Dream”, Minx Arcana, The Pink Room Dreams, Seedy Edie, Varla Velour & more! It is happening again. And this time, you’re invited. To celebrate the heralded return of David Lynch's masterpiece, BBQ Films is teaming up with our friends at Flavorpill to create a Twin Peaks playground both wonderful and strange at Brooklyn Bazaar on Tuesday, May 16. You’ll be be able to enjoy a damn good cup of coffee at the Double R Diner, explore the mysterious Twin Peaks Lodge, and interact with a variety of quirky — dare we say suspicious — characters from this quaint northwestern town, brought to life by the beauties of The Pink Room Burlesque. Come in costume to enter our Miss Twin Peaks Pageant; the prizes could be a new shirt at the men's store, a catnap in your office chair, or two cups of good hot black coffee. Unlike our usual fare, this experience doesn’t include a screening, but you can catch the new season of Twin Peaks on Showtime, Sunday, May 21. The new SHOWTIME® limited event series TWIN PEAKS picks up twenty-five years after the inhabitants of a quaint northwestern town were stunned when their homecoming queen Laura Palmer was shockingly murdered. Considered one of the most influential television series of all time, the new TWIN PEAKS stars Golden Globe® winner and Emmy® nominee Kyle MacLachlan as FBI Special Agent Dale Cooper. Directed entirely by filmmaker David Lynch, TWIN PEAKS returns Sunday, May 21 at 9PM (ET/PT) – only on SHOWTIME®. “TWIN PEAKS”: ©TWIN PEAKS PRODUCTIONS, INC. ALL RIGHTS RESERVED.